Put recipient’s age, gender, color and style preferences then we’ll do the rest so you can be a shining star! 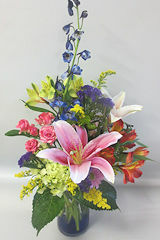 CartersFlorist.com is the only floral website with this capability. Click here to order now! Why of course we have them! on the West Coast of Florida! "I have used your florist twice without stepping in your door. 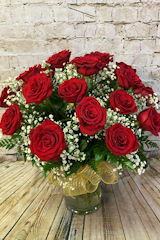 I have ordered flowers directly from cartersflorist.com sight unseen. 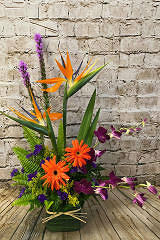 Your arrangements are beautiful, timely delivered and your customer service follow-up is excellent. I have gotten rave compliments on both arrangements. When I had the chance to see them I was very pleased. Count me in as a very satisfied, return customer!" "I don't know how to express my thanks for everything that you did to make Kirby's wedding absolutely perfect. 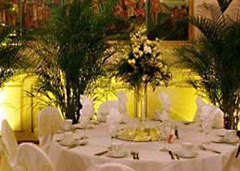 All of the guests were amazed with the elegant setting. Kirby and Matt were beyond thrilled with the florals and decor. Terry, you helped me relax and believe that everything would come out to perfection. I knew when I met you that we think alike! I will recommend you to everyone - because you are the greatest." "This is Julie's mom. I want to thank you for the wonderful flowers at Julie and Ryan's wedding. Not only were they beautiful then, but I still have some magnificent roses that are picture perfect more than a week after the event. We lined our entryway sidewalk with the centerpieces and are doing everything we can to keep the magic going! The biggest surprise was a last minute idea I had to unwrap the bridesmaids' bouquets and put them in water, 3 days after the wedding. They are still in water on our dinner table and many of them look brand new. I'll never forget when you told us that roses from a florist are not the same as store-bought. You were so right. Again, thank you! I only hope our other daughter gets married in St Petersburg. 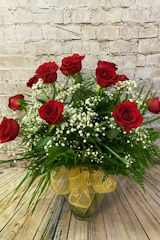 Our experience with you has made the selection of a florist a given!" "Thank you so, so much for making our wedding day so special. I cannot tell you how GORGEOUS we thought the flowers looked. We honestly could not have been more pleased. The reception room truly took my breath away. I think I jumped up and down squealing when I saw the feast table. I wish my bouquet could live forever. It was so perfect. I have only the most positive things to say about our experience with Carter's and will whole-heartedly pass your name along to anyone who needs the BEST florist for their wedding. Thank you for all of your hard work, your recommednations and your creativity. You really helped bring the vision we had for our big day to life!" "What an amazing wedding, thank you! Words could not describe what a great job you did and how happy I am with your services. My wedding was everything I had dreamed of and envisioned. It is all due to Carter's! The flowers were absolutely amazing and the service impeccable. Thanks so much!" THERE IS SOMETHING SPECIAL EVERY WEEK AT CARTER'S FLORIST! For over 50 years Carter’s Florist in St. Petersburg, FL has been the florist of choice for wedding flowers, centerpieces, holiday floral arrangements, Valentine's and Mother's Day, business meetings, stage sets, awards dinners or just to say I love you with the best flowers in St. Petersburg and Pinellas County. 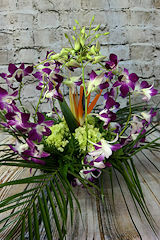 Local love our attention to detail, which is why we are the oldest florist in St. Petersburg, Florida! New brides also love our traditional wedding flowers as well as new and exciting wedding bouquets and banquet centerpieces. Our complete wedding planning services make your Florida wedding the perfect day. See our extensive wedding flower galleries. 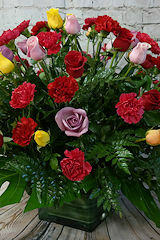 Carter's Florist in St Petersburg has earned and maintained a reputation as one of the finest St Petersburg florists in Tampa Bay and the surrounding area. 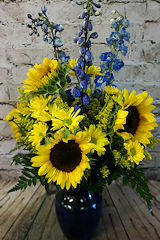 Owner Terry Hagstrom - together with a talented team of designers and delivery staff - work hard to guarantee that you receive consistently beautiful, fresh arrangements every time you order. That's how we have earned our place as the finest of florists in St Petersburg, FL and the Bay area. And our reputation extends even further. Carter's Florist is a St Petersburg Florist with an industry-wide reputation! 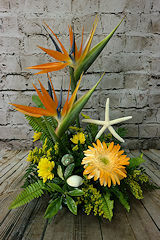 Professional Affiliations mean Professional Designs and Carter's Florist of St Petersburg, FL is a member of the FTD and Society of American Florists. 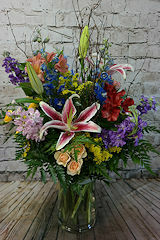 We deliver more than flowers to Saint Petersburg, FL and worldwide too! Gifts, home accents and even boxes of chocolate for that special someone are all available in our store and online! Click here. 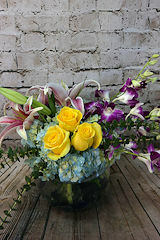 Visit or call us for beautiful, fresh flowers and gifts. 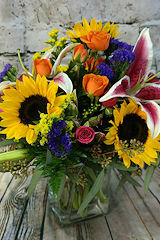 CALL 800-327-5568 FOR FRESH FLOWERS, DELIVERED!